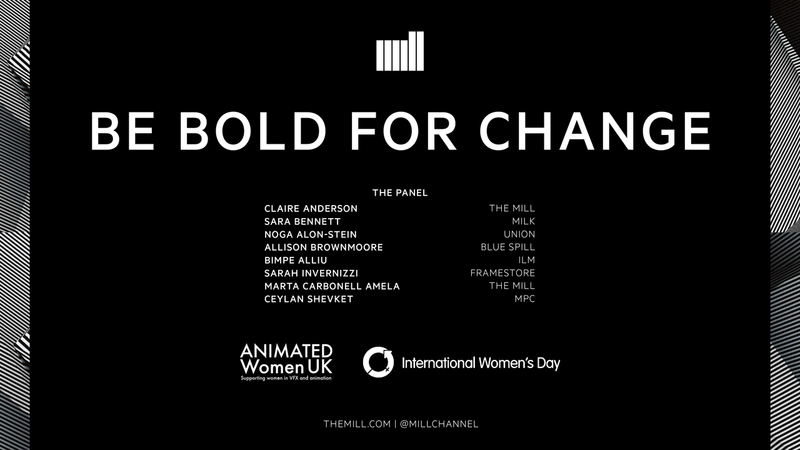 In celebration of International Women’s Day, The Mill are proud to be hosting a panel discussion this evening at their Windmill Street studio in support of the 2017 #BeBoldForChange campaign. The panel, chaired by The Mill’s very own Group Head of Talent Claire Anderson, will be hosted in collaboration with Animated Women UK, inviting attendees to take part in an important and stirring debate with panelists in various industry roles, including; Digital Artist Bimpe Allen from ILM, Producer Noga Alon-stein from Union Films, VFX Supervisor and Head of 2D Sara Bennett from Milk, Motion Designer and Co-Founder Allison Brownmoore of Blue Spill, Graphic R&D Designer Sarah Invernizzi from Framestore, VFX Artist Ceylan Shevket of MPC, and Mill 3D Artist Marta Carbonell Amela. The discussion will be followed by a Q&A session, before attendees are then given the opportunity to partake in a series of drop in sessions and drinks with top industry talent recruiters in The Loft Bar.